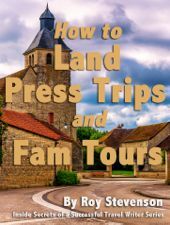 Self-guided press trip requests, or Familiarization (FAM) tours are one of my favorite kinds of tours. 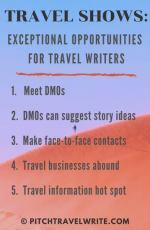 What makes them so good for travel writers? Everything about them is customized to your needs. Here’s how it works: You get an assignment. Then you let the tourism rep know where you need to go and what you need to visit at each destination. Then you turn them loose on the itinerary. It’s like having a personal travel agent. Once you tell them what you need to see, they make all your travel arrangements: accommodations, meals, transport, and entry to tourist attractions. 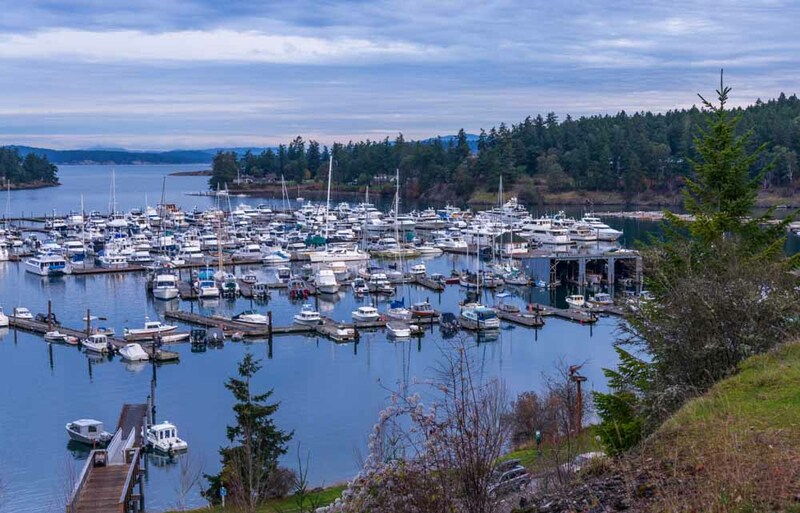 Looking down on Roche Harbor marina on San Juan Island early one morning. Self-guided FAM tours are more difficult to put together than going along on a group press trip. They require more work up front because they are personalized for your needs. But they are potentially more rewarding than organized group press trips. Because it’s completely customized to what you need for your assignment, a self-guided FAM tour may only last one day, a weekend, or longer. It all depends upon the strength of your assignment(s), what you need to see and do, and the budget/generosity of the local Convention & Visitor’s Bureau (CVB). I’ve been on dozens of self-guided press trips and enjoyed them immensely. These trips were in return for print and online stories that I later wrote about these destinations. An attraction-packed 12-day whistle stop tour of Southern Oregon. 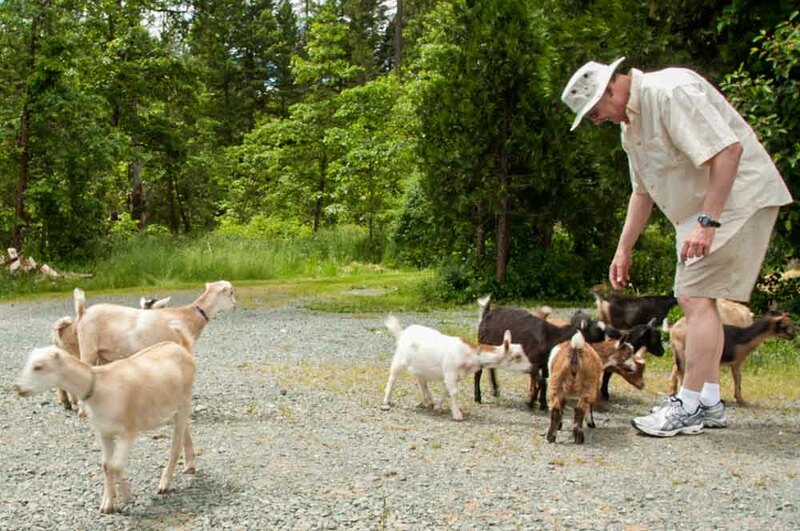 Pygmy goats take an interest in me - or my shoelaces - at Pholia Farm in Oregon. 2. Pitch some story ideas to editors and get a letter of assignment. 3. When you have a confirmed letter of assignment, contact the CVB at your destination and let them know the details of your trip. Your press trip request asks if they can help you organize it. If they agree to assist you, this is a big time saver. The CVB media reps know where each attraction is located, how long you’ll likely need to spend at each one. They know how long it takes to drive from one place to the next. 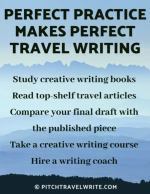 These trips are a great way for a new travel writer to start out because they’re local, they require minimal organization, and very little travel and expense. These are the simplest and easiest FAMs to organize. During my first couple years of travel writing I did plenty of these day trips, primarily around the Pacific Northwest, and enjoyed them immensely. My wife and I have explored practically every scenic destination marina around Washington State’s Puget Sound on day trips. For several years I wrote the marina destination articles for a monthly yachting magazine, and my wife did the photography to accompany the articles. On one of these trips to Port Orchard, Washington we were hosted by the local CVB. The media reps showed us around town and took us to lunch. They toured us through a unique bonsai garden that I didn’t know existed. It turned out to be an added bonus. When I got home I pitched a story about the bonsai garden to a gardening magazine and sold a second story. The CVB was thrilled to get 2 stories, just for spending a little time with us. 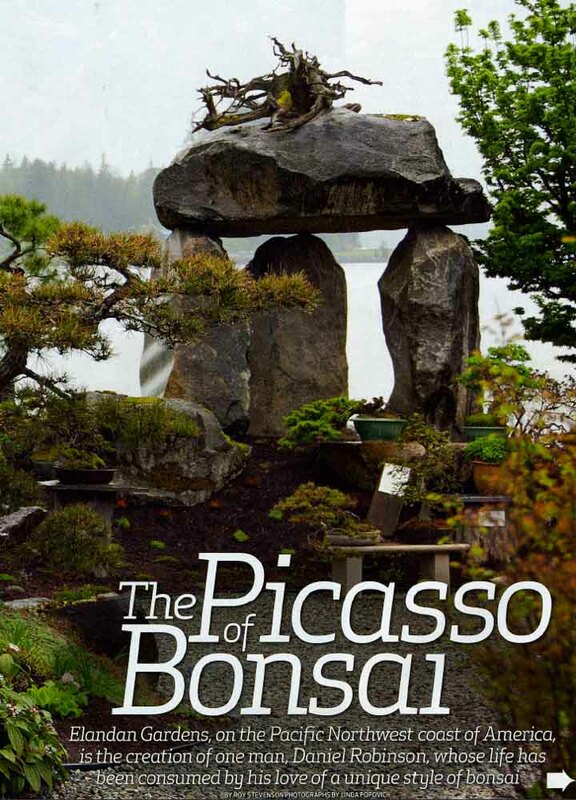 In Port Orchard our CVB hosts toured us through Elandan Gardens, an unusual bonsai garden that led me to pitch this article to a UK gardening magazine. Once you have rounded up an assignment or two, contact the local CVB in the town you plan to visit with your press trip request. Politely ask for their help planning your itinerary, especially if you have a variety of places to visit. They can also help you arrange meals, if food is part of the article, such as for roundup stories. If you’re visiting a small town that does not have a CVB, you can often contact the tourist attraction directly and let them know you are doing a story about their attraction. Not every small town has a CVB or a budget to host your visit, so some will reject your press trip request. But if you have an assignment, it’s always worth the effort to contact the tourist office or the tourist attraction directly and find out if they can help. Sometimes a day isn’t long enough to do justice to a place. If there’s a lot to do at a destination, maybe it’s worth turning the day trip into a weekend getaway or a multi-day press trip request. • Is the destination interesting enough that you can arrange multiple stories about several attractions? 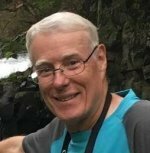 • Does it have enough to offer that you can write an enticing roundup story about the destination as a whole? With lots of tourist attractions at the destination, you can line up multiple assignments or a roundup story. Once you secure a confirmed assignment, contact the CVB with your press trip request for assistance. The CVB can help to arrange complimentary accommodations, meals, tours, and press passes into tourist attractions. Making these arrangements in advance of your trip maximizes your time and income from one trip. It’s important to plan ahead. You want to start arranging your trip early enough to make the most of the destination. Without good planning, you're likely to get there and realize you don’t have enough time to see or do everything. I recommend writing a press trip request 3-4 months in advance for regional and national press trips. This takes some extra effort, but it results in a more robust trip. Turning a day trip into a multi-day press trip with several assignments makes the most of your time and provides more income if your assignments are for print magazines. For example, if your original day trip with one $250 story has suddenly turned into three or four stories, you have quadrupled your income and created an opportunity for a nice little getaway with all attendant perks. Recently an editor asked me to do a roundup story of romantic getaways in the Northwest. I had already visited a number of the lodges for the article, but I had never been to Long Beach, Washington. So, I contacted the local media rep for Long Beach and she set up accommodations, meals and a suggested itinerary of places to visit while we were there. My wife and I had a lovely 3-night getaway and we became acquainted with a part of Washington we had not seen, even though we’ve lived here for many years. 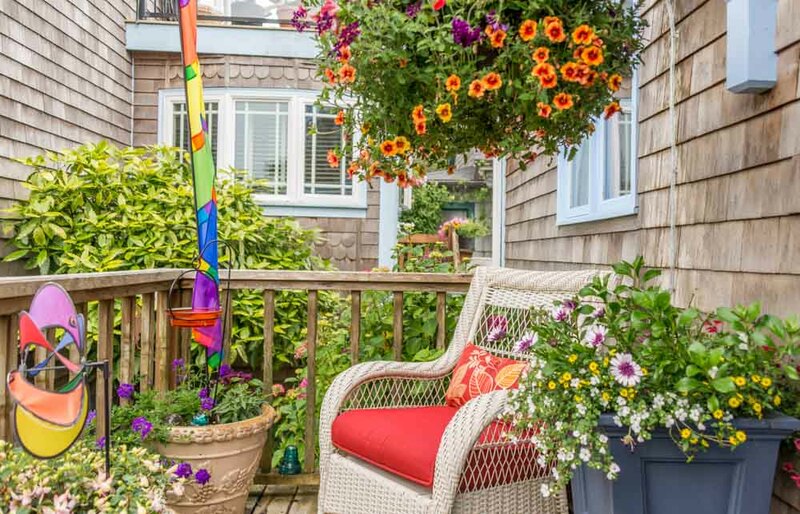 The welcoming and colorful front porch at the Boreas Bed & Breakfast Inn, on the Long Beach peninsula in Washington state. Self-guided FAMs are also possible for international destinations. I’ve done dozens of them. Once you’ve rounded up an enticing international assignment or two in high-circulation outlets, your next step should be to contact the PR/media reps at your destination with a press trip request. Your email should request their assistance for your independent, personalized tour. A couple of summers ago, during my annual six-week trip to Europe, I was the guest of VisitWales, VisitYork, the German National Tourism Office, and a European luxury barge hotel cruising company. Each itinerary was organized by the hosting agency in the European city, based on the assignments I had secured in advance. All I had to do was collect the car rental or jump on a train and turn up at each destination. Upon arrival at each new destination, I met up with a private guide, was whisked off to my hotel, checked in, and then taken on a personalized tour of the city. This is a very efficient way to travel because there’s no worry about getting lost or straying into the wrong parts of town. My local guides had the inside scoop on the attractions and made sure I made contact with the right people while I was there. It was all very efficient and organized, and stress-free for me. It’s best to organize your self-guided FAMs during off-peak seasons. During the peak tourist season, CVBs may not be able to honor a press trip request to arrange accommodations and meals for you. This is because the resorts and hotels cannot afford to lose business at a time when they’re guaranteed a full house. Sometimes you’ll only be offered press rates with your press trip request. Even if you travel off-peak, sometimes you’ll only be offered press rates, or a discounted room rate. This is where having a business policy about press trips matters. Your business policy will help you decide whether to take advantage of these discounts or scrub the trip altogether. Given the low rate of pay for travel writing these days, I usually pass on these discount offers. I abandon the story until my press trip request can be accommodated and the stars are aligned more favorably. What are Your Business Policies for Press Trips?